The Sol Republic Master Tracks sit on top of the young company’s product range. The over-ear headphones are designed and equipped to go head to head with the likes of Beats Audio’s new Studio headset, while being priced a good deal less than Dr. Dre’s offering. Founded in 2011, Sol Republic’s popularity exploded during the 2012 London Olympics, when swimming legend Michael Phelps appeared wearing the company’s Tracks HD headphones in an American flag color scheme before going for a medal. Currently, in addition to a constantly growing number of celebrity endorsers, Sol Republic boasts a partnership with Motorola which sees its products offered in alongside the customizable Moto X. The Sol Republic Master Tracks come in a good-looking, well-equipped box. Inside it, alongside the headphones, you will find soft carrying pouch, 1/4” pro adapter, as well as some booklets and stickers. All in all, the retail package of the Master Tracks covers all the bases as far as essentials go. With a defined three-piece construction and large “SOL” (it stands for “soundtrack of life”) logo on each earpiece, the Sol Republic Master Tracks follow closely the design language of the company’s over-ear range. However, the headset looks notably more upmarket than its lesser siblings thanks to larger speakers with matte metal finish, and leather-wrapped headband with embedded Sol Republic sign. I like the looks of the Sol Republic Master Tracks quite a lot. Despite being around for only two years now, the company has managed to establish distinctive, easily recognizable design language, which stands out in today’s busy market for high-end headphones. You can additionally change the look of your headphones by swapping their headband or audio cable. Different colors are available to purchase as additional accessories. Build quality is exceptional. The Sol Republic Master Tracks sport an advanced polymer headband which is dubbed indestructible. The actual headphone speakers, like I mentioned above, are made of metal, and therefore really solid. I spent several weeks with the Master Tracks as a daily driver and found nothing to frown at regarding their finish. The headphones can easily manage plenty of daily use and abuse. The Sol Republic Master Tracks feature proprietary Sonicsoft speaker pads with elliptical shape to follow closely that of your ears. The speakers are easy to adjust – you simply slide them up and down the headband until you find the desired fit. In my experience, the Master Tracks rank among the most comfortable over-ear headphones I have used. The speaker pads are really soft and comfy, so long stretches of use are not an issue. 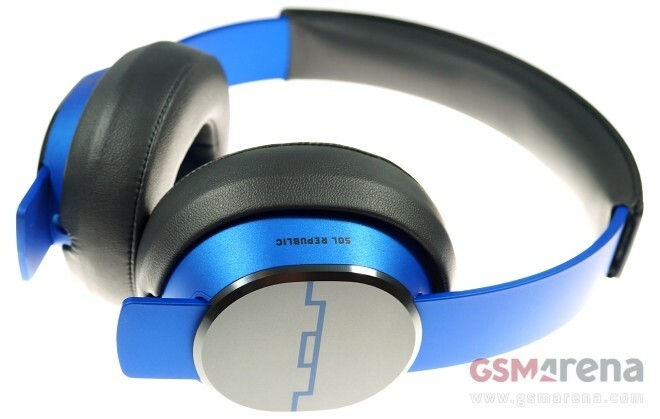 The headset’s weight is also light considering its size, thus further enhancing the comfort of use it offers. The Master Tracks feature a three-button remote control which works as expected. The middle button handles the phone calls, as well as music playback. It sits slightly above the volume buttons in the middle, so it is easy to find without looking. Sol Republic has been traditionally coy about the exact specs of its headphones and the Master Tracks are no exception. The headset is equipped with the company’s high-end X3 sound engine which is designed to deliver balanced music experience. I found the sonic performance of the Master Tracks to be bass-dominated in a subtle way. The lows are distinctively defined and free of distortion, though potentially a tad overbearing at high volume. Thankfully, unlike the case in many high-end headphones today, the mids and highs have not become victims of the powerful bass delivered by the Master Tracks. The headset proved to be capable of delivering well-sorted sound regardless of the music style. Audio quality during phone calls was loud and clear. I found nothing to frown at on this instance. The Sol Republic Master Tracks are a great entry for the company into the market for high-end headphones. The headset is good-looking, solidly-built, and comes with sound experience to match its ambitions. At $199.99 in Sol Republic’s online store, the Master Tracks cost a good deal less than the similarly capable Beats Audio headphones, without skimping on sound quality. Amazon has the headphones listed for as low as $162 depending on the color scheme, thus making them look even more tempting. I therefore find the Master Tracks easy to recommend to anyone whose budget allows picking up a pair. Furthermore, a special edition Sol Republic Master Tracks tuned by the DJ Calvin Harris is also available in case you want something more fancy. They are priced at $249.99.